In today’s busy and mobile world, many people own and use laptops instead of desktop computers, whether you work from home or in an office. Unfortunately, due to the size of a laptop and the screen and keyboard placement, generally using one on a regular desk is not very ergonomic and forces you to adopt a sub-optimal posture. Lucky for you, laptop desks are the answer you have been looking for. When it comes to spending a bit more time standing at the desk while working, there are many fantastic standing desks or standing desk risers that allow the user to achieve far better posture and ergonomics. However, if you’re primarily a laptop user, it is possible that these products are overkill, and instead, there are plenty of smaller laptop tables that will do the trick (and for a fraction of the price!). Unlike a small laptop stand, which in general is designed to prop up your laptop to a better height, a laptop table is far more versatile. In fact, many people use laptop tables outside of the office as the can be also used for working on the sofa or in bed as a comfortable tray to place above your lap. If you are someone who needs more room on their desktop than just enough for a laptop, then the TaoTronics foldable laptop desk is a great option. The desktop measures 24″ x 13″ which is plenty for your laptop and also additional papers, mouse, and extra gadgets. The surface is also tiltable, which makes this product ergonomically very friendly for your wrists, especially if you plan to use it in different positions (i.e. as a standing desk, or as a laptop table for your lap.) It can be adjusted to either flat, 15, 25 or 35 degree angles. Moreover, this product has an adjustable height, so people of many different heights can use it comfortably. With an adjustment range of 9.5 – 12.5 inches, it is not the most adjustable product on this list, but it does give you some freedom to position your laptop at a comfortable height. Lastly, this laptop table can fold flat for easy storage and transportability. Not only that, at only 5.5 lbs it is extremely light and therefore really easy to take to work, use at home and carry with you wherever you need. The TaoTronics laptop tray is, in the end, a fairly basic product. There are no frills and no special add-ons, but the good thing about this is that it is very affordable. This product was certainly not made to win any design awards, but you can’t fault it for its functionality and achieving the job it was designed for. Another issue might be that for some people it is a little too large. When people are looking for a laptop tray, they often require something extremely small. Although, as we pointed out before, this product collapses flat and is very lightweight, so hopefully the “footprint” size shouldn’t be a big factor. 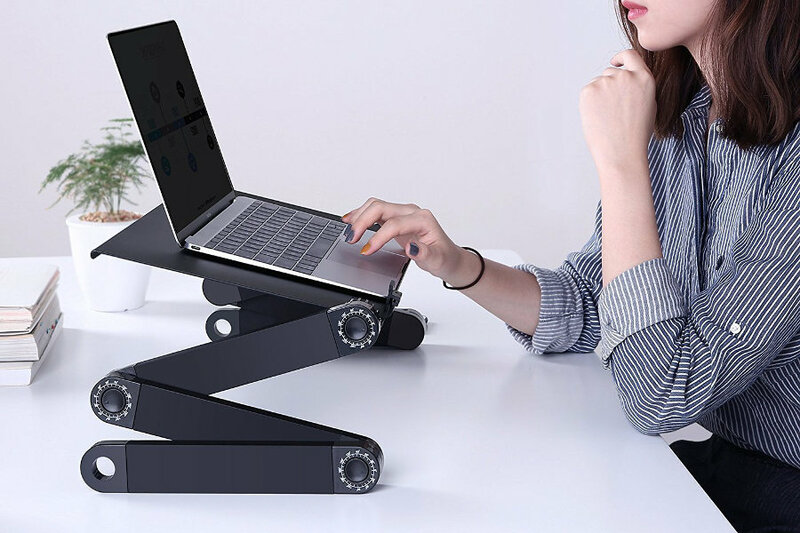 This product has been featured on Painless Movement as one of the best alternatives for the Varidesk laptop standing desk, and for good reason! One of the first things to note is the impressive height range. The AOOU Laptop Stand can extend up to 18″ high, making it a great option for taller people. Despite having a relatively small surface area, it is very functional as it also incorporates an attached mouse tray to the right of the main surface. It also has 3 points of adjustment, each of these levers allowing you to adjust the angle and position of the tray. 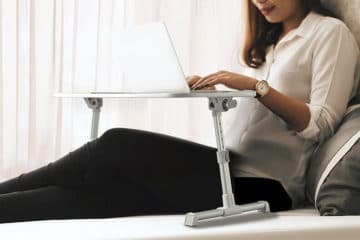 These joints are auto-locking and really make it very easy to adjust and set the position you need for this product, whether you want to use it as a laptop stand, lap tray, or standing desk. Lastly, this table only weighs 3.5 lbs and can also be flat-packed for excellent storage and portability options. Some users have made the observation that at full height the desk does start to display a bit of shakiness. This could become an issue if you plan to be using the laptop directly on the stand and doing lots of typing because this could exacerbate the issue. If, however, you plan to use it more as a monitor stand and use an external mouse and keyboard, we doubt this will ever be an issue for you. As we mentioned earlier, the main table surface is not very large and is primarily designed for more standard 13″ or 15″ laptops. If you have a 17″ laptop then, unfortunately, it won’t fit on this stand. Lastly, because the legs of this laptop desk are separately adjustable, it is recommended that you only set it up on a hard surface. By placing it on a softer surface, it is more like that the unit will become unbalanced and could fall. To sum up what we like about this laptop table in one word, that word would be: adjustability. Firstly, the table surface can be tilted upwards to 5 different angles, allowing you to maintain better screen position while you work. Additionally, if you are working from a laptop this will allow you to adjust the angle at which you type, which is great for your wrists in the long run. It also has adjustable height legs which makes it the ideal product for a number of different uses: whether you’ll use it in bed, on the couch, or as an adjustable height monitor stand. The HOMFA stand is also beautifully designed and would be a great addition to any office. The product is made from eco-friendly bamboo, which is both sturdy and aesthetically pleasing. Also, the design has holes cut into the surface of the desktop so that your laptop will stay cool and not overheat like it could on a flat surface. One factor to consider is that although this product is adjustable, does not make it as easy to adjust as a standing desk converter. A standing desk converter allows you to leave all your equipment on the desk surface while you move it up and down, however, with this product you will have to remove your things. Some users have also mentioned the fact that the screws that you loosen and tighten to move the table legs can loosen over time. Make sure at all times to keep these well fastened to have a more stable laptop desk. Above all else, this product is cheap and simple. It is made from cardboard and arrives folder and flat packed, so all you need to do is assemble and you are away! 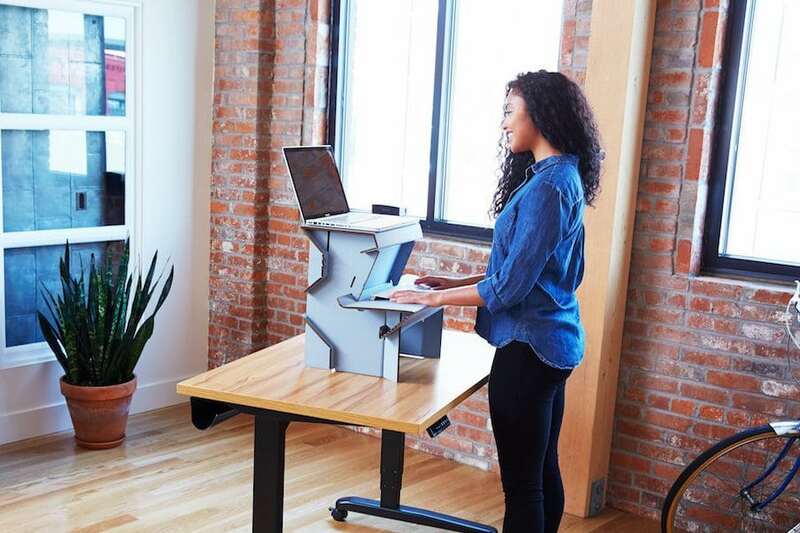 If you are looking for one of the quickest, easiest, and cheapest ways to start using a standing desk, then the Ergodriven Spark is a great option. 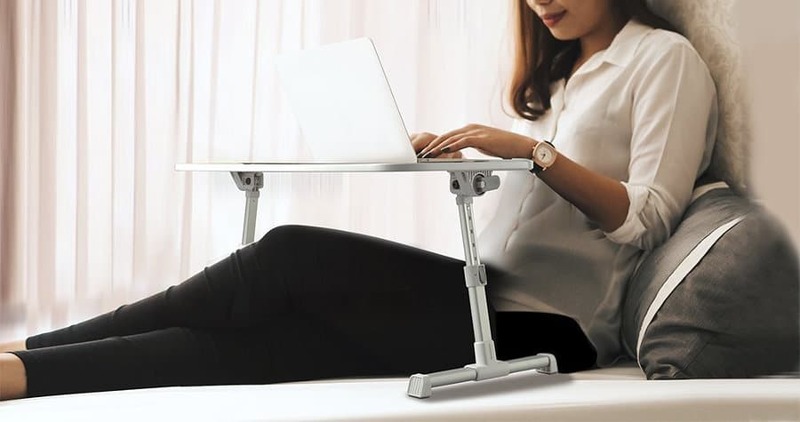 Since this is a non-adjustable laptop table, the manufacturers have done the next best thing which is to create three different sizes. The small, medium, and large sizes should be a good fit for most people. Unlike the other products on this list, this one is not so versatile, but what it is designed to do, it does well! As well as being the perfect laptop stand for your office, the Spark is sturdy enough to hold a monitor, keyboard, and mouse. What’s more, the keyboard tray is separate from the main surface, so if you do use an external keyboard you can really make the most of this truly ergonomic feature. In the end, you have to remember that this is a cardboard product. In terms of sturdiness, it comes close to the other products, but it is difficult to be as stable and sturdy as the other wooden and metal products on this list. Because of this previous fact, the Spark also has been reported to have a few minor issues with shakiness. This shouldn’t be a deal breaker, although if you require absolutely to shaking then we recommend you have a look at our final favorite product. 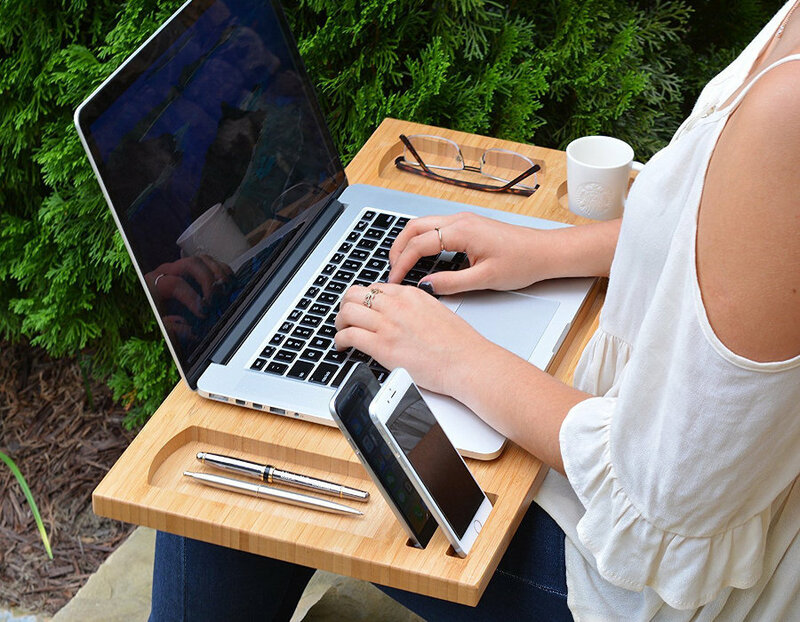 The Royal Craft Wood standing laptop tray is truly one of a kind. When you look at it initially, it is quite breath-taking in its design, and in the number of features it has. Firstly, the top tray can be removed to be used as a laptop tray on your lap. As you see in the photo it provides a perfectly flat and stable surface for this purpose. It can also be used as a simple monitor stand on your desktop, or lastly when fully assembled it is the perfect laptop table. Moreover, there is plenty of room for other products on this table. There are cutouts for tablets, mobile phones, coffee mug, pens and pencils, as well as cutouts for maximum airflow and cooling for the laptop. It even has a second tier which is ideal for extra storage. Finally, it is a very well-built and beautifully finished product. The wood finish is strong, resistant, and most importantly it is sturdy and stable. It is a great balance of aesthetics and functionality. Unlike some of the other laptop desks on our list, this one is definitely not your typical “adjustable” desk. It has its own king of versatility, but if more adjustment is what you need then you are better off with something like the AOOU. Moreover, from a couple of the customer reviews of this table, some have found it a little difficult to assemble. Any DIY lover should be absolutely fine with it, but if you tend to shy away from putting furniture together and would rather a ready-made product, then the Royal Craft Wood desk might be a test for you. As we mentioned earlier, these laptop desks are very versatile and also very portable. They can and should be used in many different places, and for different reasons, so here we will give you some of our favorite uses for these versatile products. Although we don’t recommend it, many people love to work from their bed. Being able to send a late night email, or quickly get some work done lying down in the morning can just make your life that little be easier. But don’t sacrifice your comfort and joints! Working from a laptop off your lap in terrible for your wrists, neck, and back, and if you’re not careful you may be causing some long-term damage. 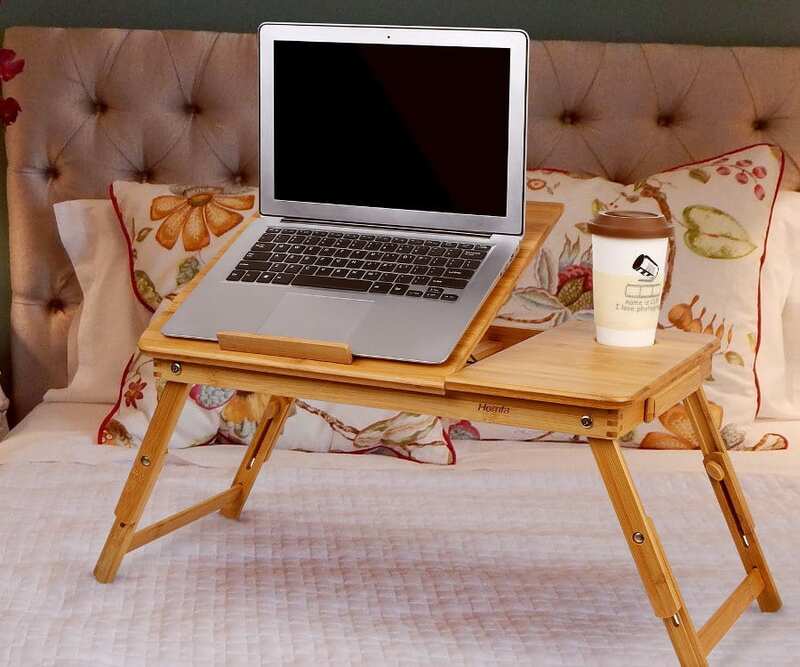 So if you’re looking for a laptop table for bed, these products are right up your alley! You can easily prop your laptop up above your lap, even have space for keyboard and mouse, and not have to worry about damaging your body while working from the comfort of your bed. As we mentioned before, working with a laptop on your lap is terrible for your posture and will cause many physical issues in the long run. To solve this problem, you need a laptop tray for your lap! Just sit one of these products either side of your legs and you’ll instantly have a functional laptop desk anywhere you need. Much like the previous two options, this next one is a clever combo of the two! Do you like to work from the comfort of your couch? Do you often find yourself in weird and unnatural positions while typing? If you answered yes to those questions then you definitely need a laptop desk for couch work! Not just for couch work, you can use this for couch entertainment. Sitting in healthy postures shouldn’t just be limited to working hours, it should be something you try to achieve all the time. Last but definitely not least, why not start standing more at work with a laptop standing desk! Many people are using standing desks for the amazing health benefits, although laptop users may find that these products are just too large and unnecessary for them. These smaller standing desks for laptop users might be the answer for you. Enjoy the portability of a laptop and the amazing physical and ergonomic benefits of a regular standing desk at the same time. Just by sitting one of these products on your desk, you’ll be able to ditch the chair and your sedentary lifestyle and get back on two feet while you work. So there you have it…the best products and how to use them effectively in order to get the maximum ergonomic benefit! If you are one of the people who much prefer working from a laptop and won’t be changing to a desktop any time soon, then we believe it’s in your best interest to give one of these products a try. Save your neck, back, arms, and wrists by correcting your posture and always maintaining better ergonomic positions while you work. We are positive that within a few moments of using a laptop standing desk that you will start noticing the benefits. So go on, treat your body, because working on a laptop doesn’t always have to be a pain in the neck!